Get 5% off your bookings for 3 months when you enroll in the Air Canada Corporate Rewards program by March 22. Air Canada's Corporate Rewards program elevates your business-travel experience: book and manage travel itineraries, track expenses, access exclusive savings and services, and more. †Discount does not apply to S, T, L, A and K booking classes on Tango and Flex fares on markets where these are offered. This offer is available to Canadian and U.S. based companies. 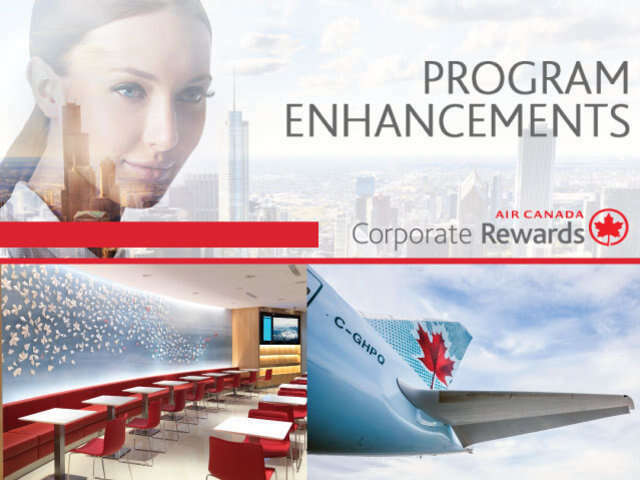 To be eligible, your company must enroll in the Air Canada Corporate Rewards program between January 22 and March 22, 2018. Eligible companies that book and travel on eligible flight bookings (as defined in section 2) will receive a 5% discount on eligible flights booked from their date of enrollment in the program for a three (3) month period. The 5% discount on a flight booking is equivalent to the base fare, exclusive of all taxes, surcharges and any additional fees, and is calculated on the booking confirmation page. 2a. Companies must register for the Air Canada Corporate Rewards online program between January 22 and March 22, 2018. 2b. Bookings must be made via the Air Canada Corporate Rewards online program on eligible flights and destinations operated by Air Canada, Air Canada Express™*, Air Canada Rouge™*, or by or our partner airlines including Lufthansa Group or one of its affiliates (Lufthansa, Austrian Airlines, Brussels Airlines and SWISS), United Airlines, United Express, All Nippon Airways, Air New Zealand and Avianca and Avianca Brazil. Please refer to our full Rewards Terms and Conditions for eligible flights and partner carriers. 2c. The eligible flight bookings can represent a combination of any fare family (Tango, Flex, Latitude, Premium 3. Economy, Premium Rouge and Business Class fares). Discount does not apply to S, T, L, A and K booking classes on Tango and Flex fares on markets where these are offered. Eligible companies that book and travel on eligible flight bookings will receive a 5% discount on eligible flights booked and travelled for a three (3) month period from the date of their enrollment in the program. Flight Pass purchases are not eligible for this offer. ® United Airlines is a registered trademark of United Airlines, Inc.
® United Express is registered trademark of United Airlines, INC.
® All Nippon Airways is registered trademark of ANA Holdings, INC.
® Air New Zealand is registered trademark of Air New Zealand Limited.